What Can Schmidt Motors Help You With Today? Looking to fix up your automotive situation? Then you will be happy to know the Schmidt Motors team is prepared to leverage their skills and expertise to help you work out the best path forward. From offering up some help as you dig into the abundance of great Chrysler, Dodge, Jeep, Ram, Chevrolet, Buick, and GMC vehicles found on our lot to scheduling your next routine maintenance, it is plain to see our dedicated staff of professionals is more than capable of providing the help you need to figure out these tough decisions. Are you excited to hear about which team has what you are looking for in your next trip to Schmidt Motors? Then go ahead and join us as we bring you up to speed and help you connect with the appropriate group of certified Schmidt Motors experts. 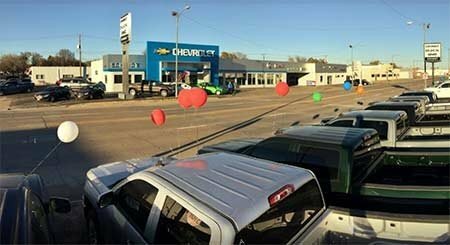 In terms of new and pre-owned car sales, nobody beats the Schmidt Motors team in Ogallala. From giving you the inside scoop on all of the latest selections from Chrysler, Dodge, Jeep, Ram, Chevrolet, Buick, and GMC to putting you on track for the right used car (including Certified Pre-Owned models and selections from other automakers) that fits smoothly into your daily duties and financial concerns, we can provide you with the insight you need to make a smart and well-reasoned choice. The best reason to connect with our sales group? Our professionals take the time to always give you the space you need to make the right call for you and your family. Only when you are ready to press ahead will one of our friendly sales experts give you the tools you need to move closer to the new vehicle that is right for you. Whether it is time to rotate your tires or you want a little help putting the pieces back together after an unexpected breakdown, Schmidt Motors wants to offer up this guarantee: We are the leading name in top-tier service that is efficient, affordable, and always handled by licensed mechanics. Own a car that is not by one of our makes available? Then that is not an issue. Our dedicated automotive experts are more than capable of servicing all manner of cars, trucks, and sport utility vehicles (SUVs) when it comes to both standard maintenance and unexpected repairs. For those of you who are looking to take care of a repair by yourself, you will be excited to hear our dedicated team of parts professionals can help you find the part you need in a jiffy. From original equipment manufacturer (OEM) replacement parts to a vast inventory of other offerings that can help you square up a repair or service on virtually any automobile imaginable, we are confident the part you need is waiting for you right now in the Schmidt Motors parts department. That being said, we can bring you so much more at Schmidt Motors than just access to the largest inventory of Chrysler, Dodge, Jeep, Ram, Chevrolet, Buick, and GMC OEM parts in Ogallala. By stopping in at Schmidt Motors, you will also make the most out of the best prices in town, along with a steadfast commitment to friendly and stress-free service. Have Another Topic on Your Mind We Have Not Covered? We Are Interested in Connecting with You! Did we not answer all of your questions? Then give us a call! Schmidt Motors is always excited to receive input from our respected customers, so make it a point to give us a call if you have any questions, comments, or concerns you want us to handle. We will be on hand to offer up as much expert insight as possible as we help you work your way through whatever problem is currently facing you down. Now that you are well-versed on the right avenues for reaching out to Schmidt Motors team, in addition to what each of our departments has to offer valued customers such as yourself, there is really only one thing left to do: Give us a call! We are excited to get in touch with you today and ensure your next visit to Schmidt Motors is the best it can possibly be.